dive resort main and the new Lost Horizon Annex resort 5min to walk from the beach. Our facility opened its doors early February 2008 at the beachfront. German. 17 years of diving experience within the Philippines and 15 years scuba diving business experience. experience within the Visayas region and 13 years scuba diving business experience. The training pool is located beside the dive center. Recovery, U/W Photography, U/W Videographer, U/W Naturalist and U/W Navigator. We teach in German, English, Japanese, Tagalog, and others on request. Beach dives, shore boat dives, night boat dives, island boat dives and day trips. 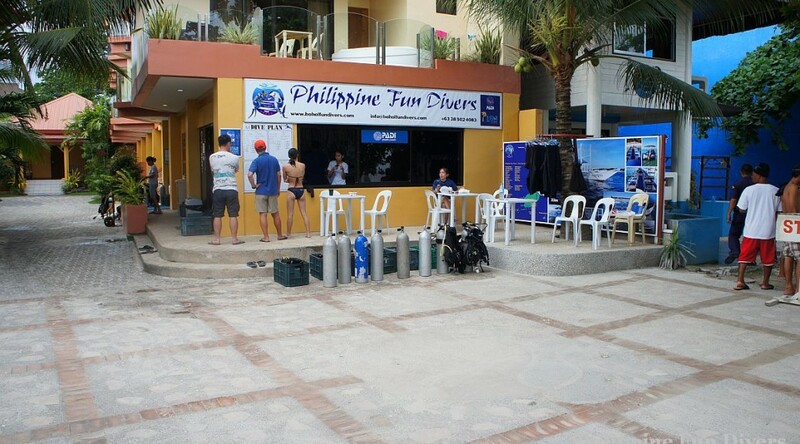 If needed, we conduct check-up dives and the PADI SCUBA review program. 3 to 7 days SCUBA Diving Safaris and 2 days Apo Island safaris, Cabilao Island day trips. charging station, dive computer for rent. so it would be better to bring cash, traveler’s cheques, or you could pay with PayPal prior to arrival. Round trip or one-way transfer: Cebu Mactan international airport to the dive center or vice versa. Round trip or one-way transfer: Tagbilaran airport / sea port to the dive center or vice versa. trip); with 1 cabin, canopy and very comfortable. One 7.3m speedboat for 8 divers/1 dive trip; with canopy and very comfortable. One 7.5m speedboat for 18 to 10 divers/1 dive trip; with canopy and very comfortable. All boats are always in top condition! If you sign up as a DAN AP Member, please do ua the favor and enter DS-0168 in the Referral Field.